You buy a car and find that the spare tyre is smooth; the tread is only just visible. If you get a puncture will it be legal to drive the car with a smooth spare tyre? You buy a car and find that the spare tyre is smooth; the tread is only just visible. If you get a puncture will it be legal to drive the car with a smooth spare tyre? A. Yes, if the tyre is correctly inflated and the side walls of the tyre are in good condition. B. No, it's illegal to drive a car with a smooth tyre even if it is the spare. C. Yes, but you must get the puncture fixed within 24 hours. Correct. 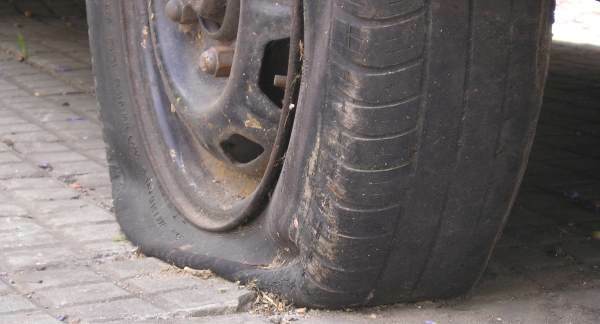 In the event that you have to use the spare because of a puncture, your vehicle will become dangerous to drive. Smooth tyres have very little grip when the roads are wet. There's an exponential reduction in grip and water dispersion performance of a tyre once the tread depth goes below 3mm. This is bad if it's a full-size spare tyre, but if it's also a space saver tyre, which is narrower than a regular tyre, there will be even less grip. The grooves in your tyre (the 'tread') disperse water on a wet road. If water can't be dispersed fast enough because the grooves aren't deep enough the tyre rides up on top of the water. This is called aquaplaning or hydroplaning, and you will have almost no grip. Less tread also makes the tyre less resilient to punctures. Tyre treads can either be unidirectional or bi-directional. Unidirectional tyres are designed to rotate in one direction so can't be switched from side-to-side, only from front to back and vice versa. If your tyres are wearing on the shoulder (edges) or in the middle, this indicates either your wheels are out of alignment, or you've over-inflated the tyres. While you might have a legal amount of groove remaining on the tyre, a worn shoulder means that as you turn a corner you have less grip when that wheel is on the outside as more pressure is on that tyre. This article has information on tyre treads and a video showing aquaplaning.